On Dec. 6, the Bureau of Land Management released a plan to rewrite federal protections for the imperiled sage grouse, a Western bird known for its chest-thumping mating displays — and for the thorny land-use debates it provokes. The environmental impact statements released Thursday give more autonomy to states and local municipalities to develop sagebrush habitat and loosen restrictions on oil and gas development in areas occupied by sage grouse. The plans undo many key parts of a 2015 plan that fended off an endangered species listing for greater sage grouse and prevented even tighter regulations on development in the sagebrush habitat the birds depend on. A rewrite of that 2015 plan has been a top priority for the Interior Department under Secretary Ryan Zinke. Even before the new plans were announced, Zinke’s department sold oil and gas leases in 720,000 acres of habitat that was supposed to be prioritized for sage grouse conservation under the 2015 plans. 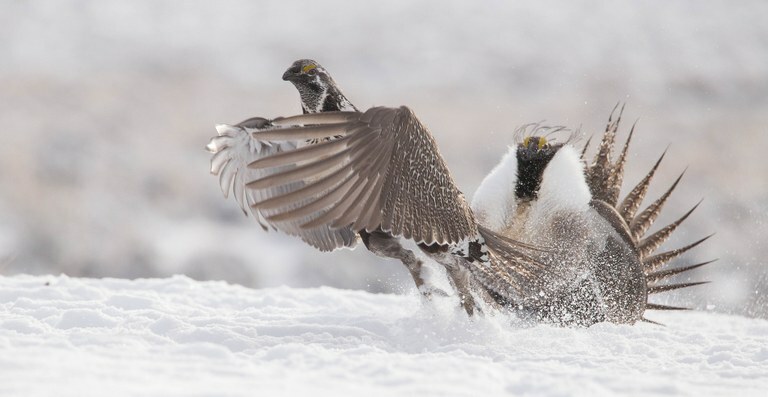 A greater sage grouse is chased off a lek in Fremont County, Wyoming. The move was a reversal of the Obama administration’s collaborative approach to protecting the birds. Under the direction of then-Interior Secretary Sally Jewell, conservationists, ranchers, oil and gas interests, states and the federal government negotatied over the 2015 plans for about five years. While the negotiations brought participants “near fistfights,” said Brian Rutledge, the director of the Sagebrush Ecosystem Initiative for the Audubon Society, the hard-fought compromises avoided the more onerous regulations that Endangered Species Act protections would likely require. The new plans have been met with a mixed response in the West. Utah Gov. Gary Herbert, R, applauded the changes. “This is a great example of federal leaders listening to state leaders, valuing their expertise, and changing their plans based on that input,” he said in a BLM press release. 165 million acres – The current range of greater sage grouse, a 56 percent decline from its historic range. 30 percent – Estimated population decline in sage grouse since 1985. 350 – The number of species that rely on the same sagebrush ecosystem that the sage grouse depends on. 11 – the number of states that have greater sage grouse habitat. 37 and 58 – the percent of the birds that live in Wyoming and the percent of Wyoming voters who approved of keeping the sage grouse habitat protection plans in place according to a November poll. 64 percent – How much sage grouse habitat is on lands managed by the federal government. 2 million acres – The number of acres included in oil and gas leasing sales to be held by the Bureau of Land Management in March 2019. 9 million acres – The swath of sagebrush habitat set to lose protections under the new BLM plans. Sources: The Wilderness Society, U.S. Fish and Wildlife Service and the Department of the Interior. Note: This story has been corrected to reflect that Rep. Raúl Grijalva represents Arizona, not New Mexico. Carl Segerstrom is an editorial fellow for High Country News. Email him at [email protected] or submit a letter to the editor.